Paola Antonelli believes no history of design is complete without the history of fashion. After many years of keeping a private list she called “garments that changed the world” tucked away in a drawer at the Museum of Modern Art in New York, where she currently holds the position of senior curator for architecture and design, Antonelli’s brainchild Items: Is Fashion Modern? just opened, making it MoMA’s first fashion exhibition in more than 70 years. Drawing inspiration from Antonelli’s original list, as well as a similar 1944 MoMA exhibition, Are Clothes Modern? comprises different versions of 111 quintessential items of clothing — everything from loafers to speedos to wearable tech like fitbits. Each is considered from an “archetype” and “stereotype” level, and for about a third of the items, Antonelli and her extensive team commissioned new “prototypes” from designers around the world. 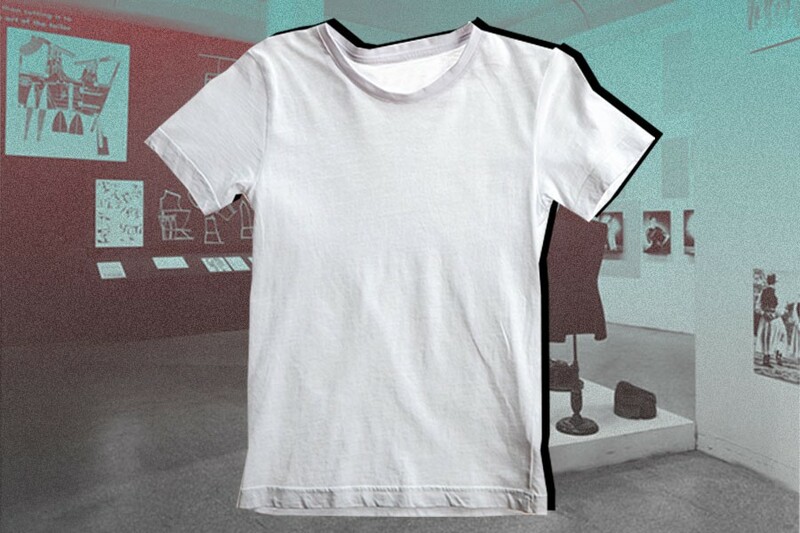 In honor of the exhibition’s opening week, I recently spoke to Antonelli about the archetypal, stereotypical and prototypical menswear items she decided to include in the exhibit; why a plain white tee is the new symbol of power for the American male; and the perfect unisex jumpsuit. How did MoMA’s 1944 exhibition, Are Clothes Modern?, inform what you did with this show? That was the only other fashion exhibition ever done here. Bernard Rudofsky curated it; he was an architect and designer as well as a curator. It was organized as an ethnographic and anthropological show critiquing the fashion of that time. In 1944, we had the emergence of Christian Dior’s “New Look,” with these really tight waistlines and billowing skirts for women. For men, fashion still involved layers upon layers, pockets and buttons. Everything was wasteful and uncomfortable for both genders. Rudofsky’s exhibition critiqued this sort of fashion design. The elaborate style of men’s dressing Rudofsky criticized seems to have been about demonstrating wealth, ownership and status. Do you think men’s fashion today is much simpler than that? Not all men’s fashion has become simple. Someone like Thom Browne continues the tradition of ornate menswear with his designs. What’s really fascinating is how the concept of power has changed. At the end of this exhibition, we address the idea of power by showing a whole series of men’s suits, including Armani suits for women. And at the end of that, we have a beautiful Savile Row men’s suit positioned in front of a white T-shirt. We did this to demonstrate that in this day-and-age, the person wearing the three-piece suit might be the bodyguard, whereas the guy in the T-shirt is the person with the power he’s protecting. We’ve gone from projecting power by being impeccably attired and having too many clothes on to do manual labor, to instead projecting power by being indifferent to these kinds of rules and being very relaxed in our own skin. Culture changes before clothes do, and clothes follow culture. Why did you choose to include Colin Kaepernick’s jersey? We included the jersey because we wanted the opportunity to show how clothes can be political. Kaepernick started taking a knee over a year ago, of course, but this topic became heated again in the last two weeks because of Trump’s tweets. 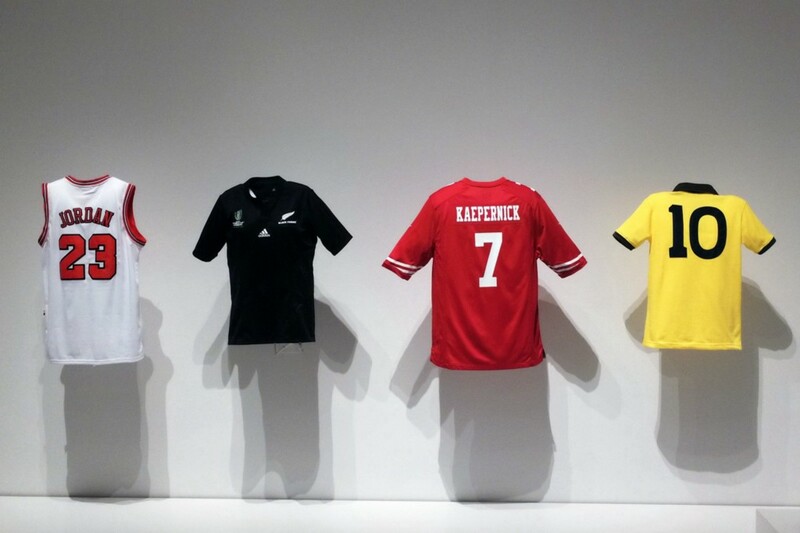 The other jerseys we have in the exhibition are Pele’s and Michael Jordan’s. We also have jerseys from the women’s rugby team of New Zealand. Interestingly, while all the men’s jerseys have the player’s name and numbers, the women’s jerseys are anonymous and bare-bones. In their unassuming nature, they highlight the way women’s sports aren’t treated with the same coverage and interest as men’s sports. There’s many layers of meaning to our sequence of jerseys. We also included other politically charged fashion items, like the turtleneck and the hoodie. Tell me more about why you included the hoodie. We show a Champion hoodie from the 1980s, and we talk about its history. With all of the items we’ve selected, we have chosen the stereotype, or the version of the item that would come to your mind if you closed your eyes and thought about it. Champion created the hoodie as we know it today in the 1930s. At the time, Champion was called the Knickerbocker Knitting Company and introduced the hoodie as a sweater that would keep professional athletes warm before or after training. Then construction workers and coal workers picked it up as well as athletes in college and the girlfriends of those athletes. Then it became a fashion item. In the 1980s, hip-hop kids, graffiti artists and skateboarders adopted it. When California banned skateboarding from parks, putting your hood up became a way to be anonymous. That’s the essence of the hoodie. It gives you a sense of protection. But that protection is almost like an illusion. Trayvon Martin might have felt he was invisible, but tragically, his sense of invisibility was seen by somebody else as a threat and that somebody else shot him dead. And so there’s a double-edged sword to this garment. Asian kids use the surgical mask in the same way. Headsets also are this kind of protective tool that allows for intimate introversion. With all of these, there can be a clear difference between how you feel and how you appear to the outside world. Did you uncover anything interesting about gender in curating the exhibition? I got to learn so much about designers — both in terms of what they made and what they said and thought. Yves Saint Laurent is one of the most genius, revolutionary designers, but his approach to unisex was still a little old fashioned. In the 1960s, he created Le Smoking, the sort-of tuxedo for women, which was his idea of unisex, but was still sort of traditionally feminine, very binary. Right next to him in the exhibition, we have Rudi Gernreich and his unisex series, which is so different than what Saint Laurent did, although they were designing at the same time. We show his designs, this sort of jumpsuit, on two mannequins. You can only really tell that one is female because of a slight bulge at the breast. Otherwise, there’s no difference. The design has a high neck that covers the Adam’s apple, so you’re not supposed to know what gender someone is. His statements were amazing. He was talking about how in the future, fashion wouldn’t be about the clothes but about the body that informs the clothes. In my opinion, masculinity has become so much more interesting. It’s no longer just one thing. It’s so nuanced. Masculinity today is really about the courage to be one’s self. Across genders, this spirit creates today’s style ethic. The most beautiful thing about fashion today is how it allows for personality and character.